I have added the Kaplan "c. 1807" to the timeline. Thanks, Huck. I don't think, that 1807 is relevant in the questions about these two different decks of different size (?). 1807 was just the earlier standard assumption about the global deck type "Petit Oracle des Dames" with some rumour about decks in the year 1800. Now we know about 2 decks in private possession from 1797 (note of Depaulis), and 1797 is also the year for the 36-cards-variation, which reappeared from a German publisher. Would be interesting to know, if the 2 versions in private possession were (more or less) identical to the "standard deck" in 1807, or if another surprising difference might be expected. : then Miss Le Normand, wielding the cards of the game of Tarot, showed the applicant No. XII the monkey, saying: "Behold your little brown man, that's your thief." Souvenirs de la Belgique, cent jours d'infortunes: ou le procès mémorable; avec des notes historiques et politiques, etc by Marie-Anne Adélaïde Lenormand, 1822. Very good. Kwaw. 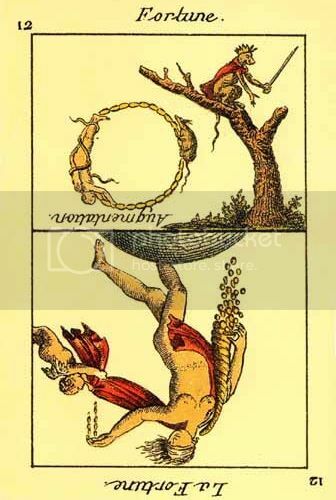 That's something that DDD missed in their chapter on Lenormand. Do you have a link? Huck, i agree that 1807 isn't important in itself. I just needed a date, if I was to put it in the Timeline. The 'standard' 36 card Lenormand deck is based on the images of the Game of Hope. Many of same cards, though in a different order, are to be found in the 32 card set of the Vienese Coffee ground cards, published in English in 1796. Thank you all in this thread. I just recieved a new L'Oracle des Dames by Dusserre with an instruction book with most of the pages missing. Thanks for the link to the "coffee grounds" book and deck, Kwaw. I didn't know that thread, and it's something I've been hoping to see. And thanks for the warning about the Dusserre, Freddie. To me the book is as important as the deck, sometimes more so. Thanks for the link to the "coffee grounds" book and deck, Kwas. I didn't know that thread, and it's something I've been hoping to see. And thanks for the warning about the Dusserre, Freddie. To me the book is as important as the deck, sometimes more so. I am not sure if all of the books that come with this deck are messed up like mine. I did email the seller and ask for a new correct instruction book. The seller offers the deck on their French website and I hope they will give me another book. I can already read with the deck as I have the Lo Scarabeo version, but I know the book to this one would deepen the experience.